I love the design! 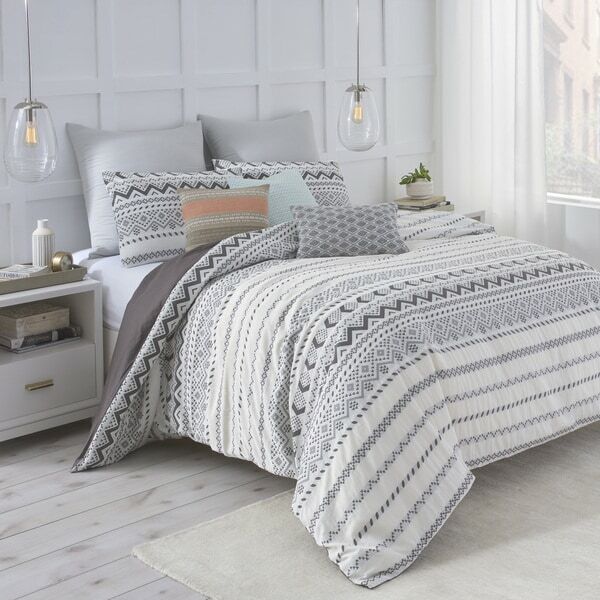 Such a cute comforter set and also very, very comfortable! The colors go great with almost anything, so it turned out perfect for my bedroom. Very thick and good quality. I couldn't be more pleased with this comforter set. It not only fits our queen-sized bed perfectly, it's nice and warm and looks wonderful on our bed. Thank you Overstock for offering such a beautiful comforter set with a great price. We bought this bedding for a guest room. It looks great and the quality is very good. I would definitely buy it or something similar again. Packaging and shipping from Overstock was outstanding the comforter set came quickly and in perfect condition. We were also able to easily find matching sheet sets in Overstock's wide variety of bedding. This comforter set is the perfect amount of color and pattern to be interesting without overwhelming the room. It's soft and warm without being too heavy. Love this bedding! Gorgeous colors! Thick! More gray, brown and white but still love it! Worth every penny! Would have bought in king for my queen because I like bigger size quilts but sold out. Still fits perfectly!! This isn't black and white. It is more cream and chocolate. Still great, but color is deceiving. Love this comforter. Not too heavy and not too light. Super soft and the material does not pick. The color is a darker gray and a darker brownish color. You can't really tell this from the online picture; it is still very pretty. It is warm and very comfortable Neutral colors go with anything. excellent quality comforter at a great price. Just what I needed to complete the look of my room. Super comfortable, I am so glad I decided on this comforter over the many I was looking at. The bedding came quickly and well packaged.The material is very nice and soft and the print is just as shown in the picture.I would highly recommend this product. Looks even better than the photo. Well made and very warm. Shipped fast and packaged well in it's own carrisack. It was stiff and felt super cheap. the gray underside was terrible. For the price I was hoping for better quality. It was uncomfortable to the touch I can't imagine sleeping under it. It felt so scratchy and it did not fit a Cal King well. This Is a nice comforter. It’s soft and looks good. Prompt shipping too. I appreciated that it didn’t come in a giant plastic bag. Very pleased as this was my first purchase ever from OS! For my boy/girl twin toddler room. I thought it worked well as a unisex bedroom set with their theme. It is the right color combination, 100% cotton and price was right. "Is the white color a bright white or cream?" "Can I buy the throw pillow to match?" Unfortunately matching items are not available. "How can I️ find the decorative pillows? " "please let me know if the white is white and not OFF WHITE. carol"
It is a slight off white. This includes two shams except the twin size comes with one only. "Need to know weight or warmth, pls."